Since 2002, researchers from the New York Botanical Garden (NYBG) and the Universidad de Magallanes to better understand and conserve the amazing diversity of mosses, lichens and liverworts found in the Cape Horn archipelago. Early results of this collaboration showed that Cape Horn hosts 7% of the world’s diversity of non-vascular plants on only 0.01% of the planet’s surface area. Using this information, the Omora Park’s team of students, philosophers and scientists turned this ecological fact into socially relevant results, including part of the justification of the creation of the Cape Horn Biosphere Reserve (CHBR) in 2005. In 2010, this inter-institutional and international team of researchers, including not only NYBG and the University of North Texas, but also individuals from the Field Museum, Duke University and the California Academy of Sciences, obtained new funding from the U.S. National Science Foundation to conduct a series of month-long, boat-based expeditions in Cape Horn between 2011 and 2014. 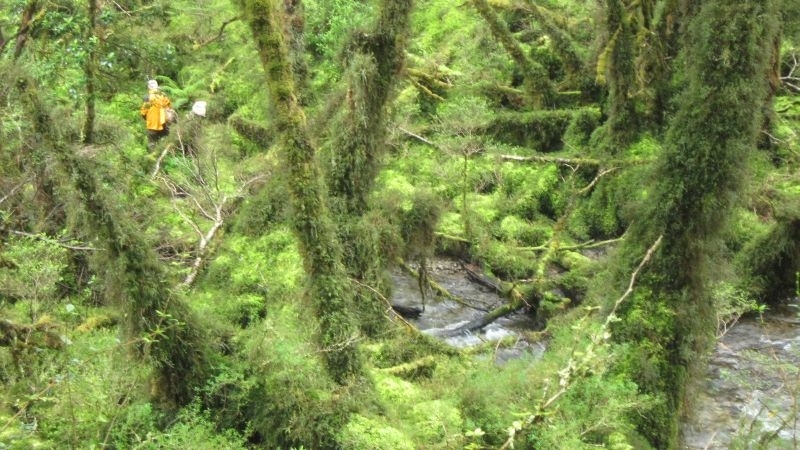 These trips to remote areas that are difficult to access and infrequently visited will allow scientists to collect and identify specimens with the goal of creating a complete inventory of the moss and liverwort species found in the archipelago and publish a definitive work on the Bryoflora of Cape Horn. Through the SABCP, this basic science project is also linked with local research, education and conservation initiatives based at the Omora Park, which is one of three networked long-term socio-ecological research sites in Chile. For example, the Omora Park has been developing a novel special interest tourism project with the support of the Chilean Ministry of Economy’s Corporation for Business Development (CORFO), which is enabling the improvement of training, publications and infrastructure for the implementation of “Tourism with a Hand Lens”, a unique opportunity for local tourism operators to obtain economic benefit by leading visitors on a discovery of the singular diversity of bryophytes and lichens found in the Omora Park and Cape Horn archipelago. Plus, in addition to the funding from the NSF, partial support of the current expedition (January-February 2011) has also been provided by the Weeden Foundation, based in New York, to aid the participation of Chilean students from the Universidad de Magallanes’ Masters of Science in Sub-Antarctic Conservation Program. In this way, students working on projects in marine science, invasive species, moss/insect interactions and watershed ecosystem services were also able to participate with the prestigious team of bryologists, thereby facilitating broader impacts of this expedition in the areas of interdisciplinary research and training of students from the U.S. and Chile. Cape Horn is globally known as a landmark for sailing and as the closest point of land to Antarctica, where hurricane force winds and torrential rains lash the coast year round. However, increasingly, thanks in part to the work of the Sub-Antarctic Biocultural Conservation Program (SABCP), it is becoming equally renowned for its diverse climates and ecosystems that create a unique combination of biological and cultural diversity. For these reasons, a co-produced series between the BBC (UK) and the Discovery Channel (USA) came to the Omora Park to film a program about the role of the sun in affecting weather patterns and in turn the role of weather in influencing ecosystems and biodiversity. Tentatively entitled 23 Degrees, referring to the Earth’s tilt off the sun’s axis, the series will feature three hour-long programs that range from the cold Canadian arctic to the dry Atacama Desert. The team visited two principal areas. First, they filmed on La Bandera Mountain, showcasing the lichens and cushion plants that are adapted to the harsh conditions of wind, cold and UV in the high Andean zones of the Omora Park. Then, navigating aboard the Santa Maria Australis, the group visited the western portion of the archipelago, where Dr. Christopher Anderson, coordinator of the SABCP, emphasized the importance of the extremely wet conditions there in creating a “moss kingdom” in which tiny plants such as mosses and liverworts are not only diverse, but extremely abundant and even dominate the landscape. Additionally, the show will discuss the importance of Cape Horn as a world priority research site for un-polluted and “virgin” forests, as the sub-Antarctic ecoregion has nearly no air or water pollution and experiences extremely low impacts from modern human society. 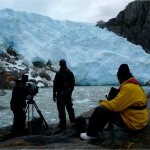 Therefore, filming also included visits to remote glaciers along the Darwin Mountain Range of Tierra del Fuego Island. According to Dr. Anderson, “for years the sub-Antarctic ecoregion has been overlooked by researchers, conservationists and even documentary film makers. Through the long-term socio-ecological research being pioneered at the Omora Park and in the Cape Horn Biosphere Reserve, we hope to not only revert those trends in research, but also make real contributions to social wellbeing in the far south by promoting sustainable activities such as ecotourism that take into account these unique ecosystems and species that make the archipelago special on a global level.